Addomesticare Ibsen per l’Italia: la canonizzazione di un nuovo Ibsen “italiano” ad opera di Enrico e Icilio Polese, tra 1891 e 1894. Why would Italian theatregoers not stop laughing when Henrik Ibsen’s characters talked about “the wild duck”? Why did Ghosts become Ibsen’s greatest success on the Italian stage, in contrast to its reception elsewhere in Europe? What kinds of challenges did Ibsen’s translators and middlemen face in Italy, and how did local audiences react to this new drama from the North? 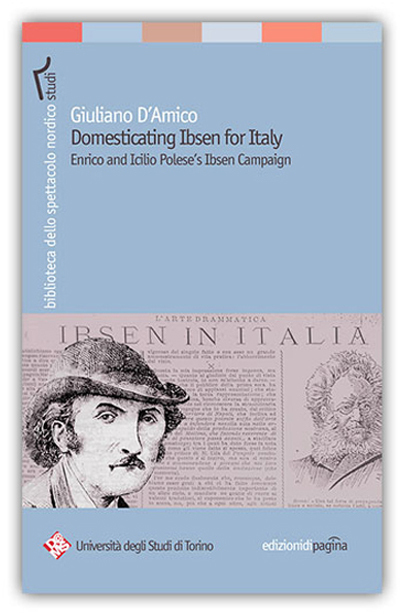 Domesticating Ibsen for Italy addresses such questions and investigates the radical transformations which occurred to Ibsen’s texts when they were first introduced in Italy. Domesticating Ibsen for Italy focuses on the “Ibsen campaign” run between 1891 and 1894 by the theatrical agents Enrico and Icilio Polese, who translated and introduced eight plays by Ibsen to the Italian stage. On the basis of extensive archival research and textual analysis of the translations, this book documents how the Poleses contributed to Ibsen’s canonization by moulding and marketing a new, “Italian” Ibsen. Il volume (in lingua inglese) indaga le trasformazioni radicali che subirono i testi del grande drammaturgo norvegese quando furono introdotti sulle scene italiane, tra il 1891 e il 1894, dagli agenti teatrali Enrico e Icilio Polese, contribuendo alla canonizzazione di un nuovo Ibsen “italiano”. Giuliano D’Amico is Associate Professor of Scandinavian literature at Volda University College, Norway. He has published several articles on Nordic authors and has co-edited the anthologies Den engasjerte kosmopolitt. Nye Bjørnson-studier (Novus, 2013) and Lyset kommer fra sør. Italias frigjøringskamp sett av datidens norske forfattere (Gyldendal, 2011). Giuliano D'Amico è professore associato di letteratura scandinava al Volda University College, in Norvegia. Ha pubblicato diversi articoli su autori nordici e ha co-curato le antologie Den engasjerte kosmopolitt. Nye Bjørnson-studier (Novus, 2013) e Lyset kommer fra sør. Italias frigjøringskamp sett av datidens norske forfattere (Gyldendal, 2011). Per le Edizioni di Pagina ha tradotto e curato, nel 2009, il dramma Un fallimento di Bjørnstjerne Bjørnson.